More often than not, the names assigned to Russian planes, rockets and tanks appear to be nothing more than a cryptic combination of letters and numbers – however this is far from the case. RBTH presents a guide to the various systems and approaches used to name Russian-made military hardware, from shoulder-mounted rocket launchers to bombers. Historically, Russian airplanes are named after their creators, or rather the design bureau where they were developed, with numbers indicating the development number. Additionally, odd numbers are usually issued to fighters, attack planes and interceptors, although there are exceptions to this rule – the Tupolev Tu-95 bomber or, for example, the Antonov An-125 freighter. If we take the Su-27 as an example, “Su” is the abbreviated name of the design bureau that developed the plane – Sukhoi – and 27 is the development number. Often the numbers are followed by letters. First comes the letter “S,” which indicates that the aircraft is a serial product. Then, as development and further work on the model continues it receives the letter “M,” which means “modernized.” This letter can then be followed in turn by the serial number of modernization. For example, Su-27SM3. Then sometimes there is the letter “K,” which stands for “commercial,” meaning the product is exported. The letters “UB” mean “combat training” (uchebno-boevoi) and “P” means that the aircraft is an interceptor version (perekhvatchik). Whenever a bomber or fighter with fundamentally new combat capabilities is created based on a previously existing aircraft the digital signage changes too. So, a bomber modeled on the Su-27 was assigned the name Su-34 and 4++ generation aircraft, being in fact a profoundly modernized version of the Su-27, was assigned the name Su-35. Regardless of the design bureau and the plant where the machine was designed and produced, there is a universal symbol “T,” which means “tank.” Next comes the year in which the machine was ready to be transferred to the armed forces. The T-72 tank entered service in 1973, the T-64 and T-62 in the early 1960s. Before entering military service the armored vehicles are called “objects,” with an added factory index. So the latest Russian tank, Armata, still carries the name “Object 148,” but after being received by the armed forces it will be officially named “T-14” since it was in 2014 that the first ready-made prototype was demonstrated to the army authorities. As for the letters that come after the numbers, the story is similar to the aircraft one, only here due to the large number of upgrades besides the letter “M” they are also marked with “A” and “B,” or in case of global modernization with an “Y.” In addition, the “K” stands for command tank, and “C” for export. It is worth noting that the best-selling tank in the world in the period from 2001 to 2010, the T-90, entered service under a new index only at the whim of the Kremlin. Essentially, this tank is a modernized version of the T-72 and was supposed to enter the army under the name T-72BU. Artillery carries fairly particular names. 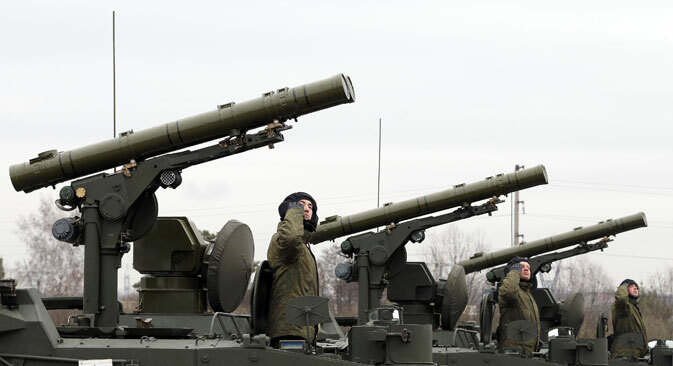 Everything that begins with “9K” shoots missiles and rockets (MLRS), everything that begins with “2C” refers to self-propelled guns, “2A” refers to guns, howitzers, firing batteries, and “2B” – to mortars and armored rocket launchers. When it comes to missile armament and defense the situation becomes more complicated. These armaments work within a system, and the name of a specific machine is often represented by a specialized index, which is rarely encountered in popular publications. So the S-300 air defense system includes surveillance radars, tracking and target illumination stations, various missiles, charging machines, etc. With the S-300 and S-400 the numbers after “S” indicate the weapon’s maximum range. In addition to alpha-numerical designations of weapons, names are sometimes given on the basis of other traditions: for example, what the weapon is associated with: the Needle (Igla) and Arrow (Strela) are different types of MANPADS (Man-Portable Air Defense System), or shoulder-mounted rocket launchers. Otherwise the developers come up with a series of synonymous names. This is how, in addition to letters and numbers, a series of self-propelled artillery platforms received easily memorable “flower” names: Peony, Hyacinth, Tulip, Chrysanthemum.